Hello Friends and welcome back! I've got 2 very different Hello cards to share for my final DT post at the Dies R Us Inspirational Blog. Both cards use several of my Favorite Cutting Dies by Sue Wilson. For this Hello Beautiful card, I've combined some older SW dies with some newer SW dies. 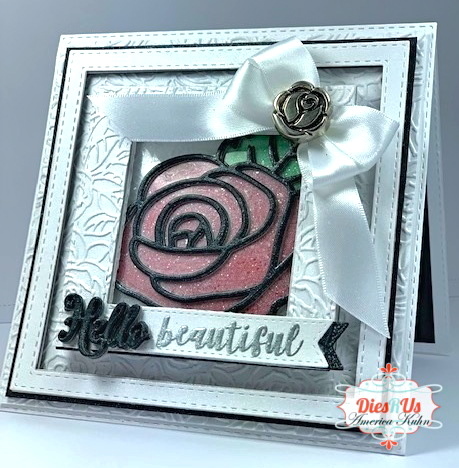 White, Black Cardstock, Acetate, Satin Ribbon, Roses EF by Sue Wilson, Silver Embossing Powder, Rose themed Button, Sentiment Stamp (for Beautiful word). Dry Emboss Panel and Die Cut framings with Stitched Squared Dies. Next, die-cut the Rose Flower several times out of Black Cardstock, Red CS and Green Cardstock. Paper pIece the Flower and leaf then readher. Layer flower with extra cuts for depth and add framing. Die-cut the Hello word several times and adhere layers. Next Heat emboss the word beautiful with silver EP and die cut with the stitched flags dies. Adhere on bottom of frame. Make handmade bow and add a silver flower button to the center. I've used a heat gun. Lastly, I sprayed silver shimmer mist to the whole design. For this card, I've also combined the newly released SW Herringbone BG die with older dies for a fun masculine look. Layer your Herringbone die cuts twice. Add Vellum over this panel. 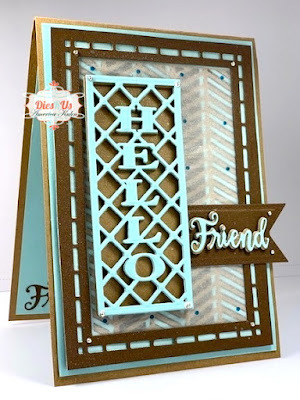 Next die-cut, layer and adhere the Hello sentiment panel several times (this adds great dimension). Then die-cut the Flags and the Friend word. Adhere as shown and place under the Hello Panel. Next Die-Cut the Australian BG twice and back it with blue cardstock around edges. Then adhere that edge over the BG to frame. Finally adhere to your card base. The finishing touches are silver flat-back gems and silver spray mist. Then hurry on over to my awesome Facebook group of SW FANS! We love sharing and creating! You'll be inspired! We interact, share ideas, tips, tricks, tutorials, fabulous makes and so much more using Creative Expressions products by Sue Wilson! 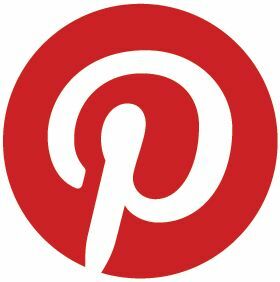 Click HERE to go directly there to join the FUN! Both are amazing, America. I am always grateful your sharing the instructions. Lovely depth on your cards, great layers and gorgeous colours. Kisses, my talented friend. They are both gorgeous, great designs layering those gorgeous dies! Two beautiful cards. Very elegant. These are both gorgeous!! I love the textures on both backgrounds. And all the dies you used are fabulous! Thanks for playing with The House That Stamps Built. Both cards are very nice! I love the bow on the first one and the texture on the second. Thanks for joining us and good luck with your entry! Lots of details here. Love the blue and brown. Lovely cards. Thank you for joining us at Cardz 4 Guyz. Sian. You already know how much I LOVE your creations America and this one is just so lady like sweet! Well done! Thanks so much for joining us at The Sisterhood’s ‘One for the Ladies/Girls’ challenge and please come back again soon! Both variations so beautiful ! Terrific cards!Thank you very much for joiningus over at Try It On Tuesday! Happy weekend! Stunning cards! There's so much inspiration here. Thank you for playing with us at the Sisterhood of Crafters and hope you can join us again soon. Two gorgeous cards with lovely details. Great masculine card! Neat die cuts too. Thanks for joining us at Little Red Wagon. Both projects are beautifully executed. The layering on the first card is simply gorgeous! Thanks so much for sharing at Shopping Our Stash! Lovely cards. Thanks for playing along with us over at Use Your Stuff. Wow! Both cards are fabulous -- So happy you linked up to the Tic Tac Toe Challenge over on The House that Stamps Built. Fab cards - beautifully put together. Wow, I can clearly see why they are your favourite dies. You have created 2 very nice projects! Both cards are very different, but so wonderful! Thanks for sharing with us at As You Like It Challenge this week! Beautiful cards. I especially love the herringbone die on the masculine card. Thanks for sharing with Crafting by Designs. Oh WOW - they are gorgeous. My hands were itching to go online and purchase these dies. Just hauled them back in time as my wallet would be permanently impaired if I did! I love that colour combo for the male card -so mouthwatering. Thanks for sharing your inventiveness with us at Unstampabelles. Thanks for sharing and for celebrating friendship with the crew from SHOPPING OUR STASH!! A great masculine card. Thanks for joining us at Cardz for Guyz. Great card. Thanks for sharing your masculine card with us at Unstampabelles. Both cards are awesome. Its great to seen your post.